H. Rick Bamman - hbamman@shawmedia.com A fire department diver works to secure a tow line to a vehicle after the car plunged into a pond at Corporate Drive and Randall Road in Algonquin on Wednesday, April 2, 2014. The driver was rescued through the sun roof as the car began to sink. 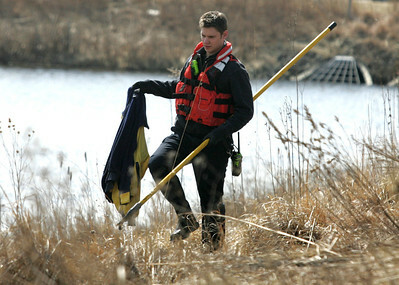 H. Rick Bamman - hbamman@shawmedia.com A firefighter recovered a jacket after a car plunged into a pond at Corporate Drive and Randall Road in Algonquin on Wednesday, April 2, 2014. 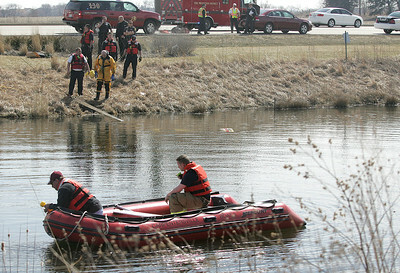 H. Rick Bamman - hbamman@shawmedia.com Firefihters use sonar to check the pond after a car plunged into the water at Corporate Drive and Randall Road in Algonquin on Wednesday, April 2, 2014. 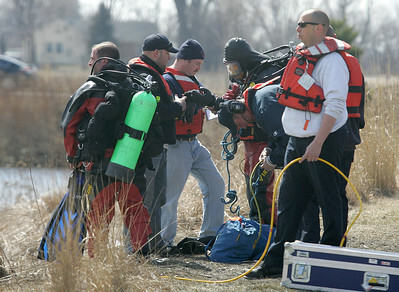 H. Rick Bamman - hbamman@shawmedia.com Fire department divers stage at the scene after a silver Honda sedan plunged into a pond at Corporate Drive and Randall Road in Algonquin on Wednesday, April 2, 2014. H. Rick Bamman - hbamman@shawmedia.com Firefighters deploy equipment after a vehicle plunged into a pond at Corporate Drive and Randall Road in Algonquin on Wednesday, April 2, 2014. 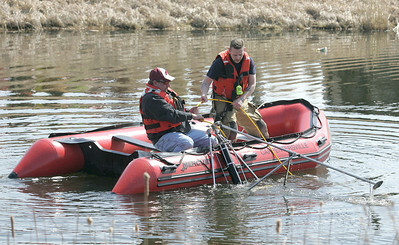 H. Rick Bamman - hbamman@shawmedia.com Fire department crews retrieve equipment after a Honda sedan plunged into a pond at Corporate Drive and Randall Road in Algonquin on Wednesday, April 2, 2014. The driver was rescued through the sun roof as the car began to sink. H. Rick Bamman - hbamman@shawmedia.com A silver Honda sedan is pulled from a pond at Corporate Drive and Randall Road in Algonquin on Wednesday, April 2, 2014. 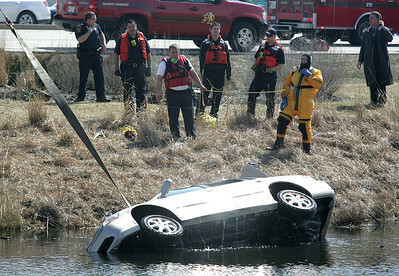 The driver was rescued through the sun roof as the car began to sink. Firefighters deploy equipment after a vehicle plunged into a pond at Corporate Drive and Randall Road in Algonquin on Wednesday, April 2, 2014.